New Jersey frees young snow shovelers… a brief update from snowbound Baltimore… how Bloomberg became Bloomberg… and more! Sounds ominous… even if the implications aren’t necessarily obvious. Only a week remains in January, and we’re tardy rolling out the last of our editors’ forecasts for the year. This is a big one. “This debt crisis is something that very few, if any, investment professionals are talking about,” says Zach. “But more importantly, this debt crisis will also bring some extraordinary opportunities for alert investors. “This year, a number of well-known companies that you may actually have in your investment portfolio are going to face a crisis,” Zach explains. Yes, that’s the flip side to the mainstream jabber about “record amounts of corporate cash.” All that cash is offset by record amounts of debt. Super-low interest rates courtesy of the Federal Reserve encouraged corporations to load up on debt in recent years — mostly by issuing bonds. “A bond is simply a debt that the company owes to investors,” says Zach, getting back to basics. “That debt includes regular interest payments and an end date when the loan is to be repaid. Bonds trade on the market much like stocks, and the price of bonds move up and down based particularly on how likely the company is to repay its debt. “With interest rates so low, many companies have borrowed unwisely,” Zach goes on. And the bill will come due this year. “As interest rates start to rise and it becomes harder and harder for these companies to raise more debt, I expect there to be a crisis,” Zach goes on. Even if you don’t own those bonds, the stock of those companies will also get hit hard. [Ed. note: This will be a slow-motion crisis. As the year unfolds, Zach will introduce us to his strategy to seize on the opportunities this crisis will make possible. In the meantime, we direct your attention to his favorite strategy to profit from market volatility — of which there’s been no shortage in 2016. So far this month, his readers have had the chance to pocket $1,490 in instant income. So much for “the first positive week of the year” in the U.S. stock market. At the close on Friday, the Dow Industrials ended the week up 105 points. As we write this morning, 100 of those points have been wiped out. The index has given up the 16,000 level — dragged down by Caterpillar, off 3.3%. It’s more of that “global slowdown” thing: Crude has given up Friday’s big gains and is back to $31.06. Among the few traders who aren’t snowbound, the chatter is about a merger between the industrial firm Johnson Controls and Tyco International. It’s another one of these “inversions” that will give Johnson Controls an Irish headquarters and lower taxes. In earnings-land, the big announcement was from McDonald’s — which vaulted a very low bar set by “analyst expectations.” Snooze. If you missed our announcement last week, David Stockman expects a major earnings shock this coming Thursday — opening up an opportunity for 300% gains if you play it right. More details tomorrow… but if you don’t want to wait, you can get a sneak peek here. With the safety trade on, Treasuries and precious metals are benefiting. The yield on a 10-year Treasury note is once again approaching 2%. Meanwhile, gold is poking above $1,100, the bid at last check $1,107. And silver’s up 1.6%, at $14.22. 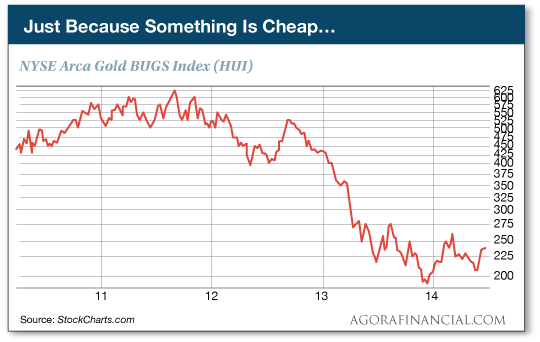 Precious metals stocks, you wonder? Still bumping around near lows last seen in 2002. 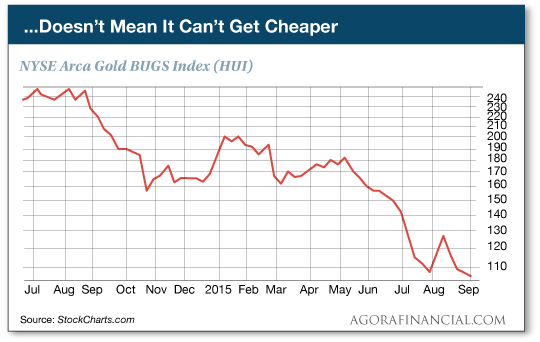 That’s what gold-stock investors have done for years… to their everlasting pain. Here’s a chart of the HUI index from 2010–2014. It includes the top in September 2011… and the subsequent 62% drop. In October of last year, there was a 30% ramp from that level… then another collapse. Last week, the HUI fell below those lows of last fall. This morning, it’s “recovered” to nearly 110. So what went wrong for people who thought they were buying at the bottom? Trading Guru X says the problem was they were following one of Wall Street’s allegedly tried-and-true rules. “Follow this rule and you will end up in the poorhouse,” he tells us. Just in time for the blizzard this past weekend, the New Jersey state government did a favor for young entrepreneurs. Last week, Gov. Chris Christie signed a “right to shovel” law — ensuring young people can offer their snow shoveling services without the permission of local bureaucrats. The law was inspired by two high school students in the town of Bound Brook who tried a year ago to make some extra cash after a heavy snowfall. But they ran afoul of an ordinance against unlicensed solicitors and peddlers. Fortunately, police chose not to arrest them… but the story made it into USA Today and inspired state lawmakers to act. “Stay Home!” reads the first of several emails we got expressing concern for our well-being amid the blizzard. “While I appreciate the effort to publish The 5 on Monday after the snowstorm, it’s not worth the risk and aggravation. “If it get as bad as predicted, traffic will be a snarled mess, with cars abandoned by people who got stuck trying to buy extra cat food, bottled water and other necessities to survive the snowpocalypse. “Stay home with your families, or cats, and enjoy the day off. “You can give everyone a prorated refund for their subscription cost to The 5. The 5: We’re compromising on your generous offer, as Baltimore recovers from an all-time record snowfall of 29.2 inches. From what we understand, most of the main roads into the city are clear. But based on past experience, the sidewalks are surely a disaster. Colleagues with a 45-minute drive face less danger than I would on my 10-minute walk! And so today’s 5 comes to you via a decentralized and resilient network. Your editor is writing at home, cat on lap. (If she sits still, I can type comfortably.) The designer who draws charts and makes my Word document Web-ready is working from home. One of our proofreaders/fact-checkers is stranded in the suburbs, but the other trudged in on foot, and her walk is longer than mine. That’s dedication. Or youth. Or both. “Not voting is the wrong tactic to use against the establishment in D.C.,” writes a reader reacting to Friday’s mailbag. “Don’t not vote,” he says, “but don’t vote for any Republican or Democrat — only for Libertarian, Constitution or Green Party candidates. The 5: Heh… Your missive arrived in our inbox before the establishment decided to outflank you on Saturday, by floating the notion of ex-mayor Michael Bloomberg of New York running as an independent. “Independent” somehow implies being separate from the power structure. Mr. Bloomberg is anything but. “Bloomberg was successful,” wrote economics blogger Robert Wenzel a few years back, “because of a monopoly on an inside Treasury securities quote it could provide that no one else could. “In the 1980s,” he explained, “Bloomberg had the right to supply the ‘inside quote’… It’s the quote that primary dealers (those that trade with the Fed) show amongst themselves when trading Treasury securities with the Fed. Back in the ’80s, the Federal Reserve didn’t announce in advance changes in their fed funds policy. You would get a sense for what the Fed was doing by watching what trades the Fed was putting on. “This trading was done through the primary dealers and was reflected in the primary dealers inside quote on Treasury securities. When the Fed entered the market, you could tell by seeing the changes on the inside quote as the primary dealers adjusted their quotes to the Fed trades. Before Bloomberg, the only people that saw the inside quote were the primary dealers themselves. Neither of these are “news” if you’ve been reading The 5, so we won’t belabor it today. Jim Rickards started warning us about trouble with junk bonds in emerging markets and the energy sector a year ago. Subscribers to Rickards’ Intelligence Triggers have recently parlayed the trend for gains including 112% in three months… and there’s more where that came from. How did Jim spot the trouble in junk bonds so long ago? Believe it or not, the answer goes all the way back to how the Allies won World War II. Jim tells the remarkable story when you click here.